Mastering the basic concepts of mathematics is the key to understanding other subjects such as Economics, Finance, Statistics, and Accounting. 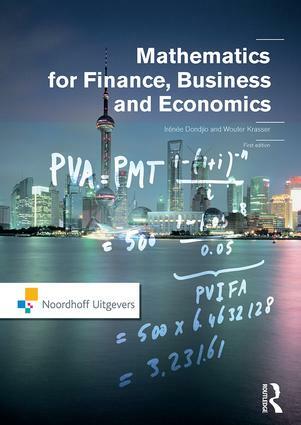 Mathematics for Finance, Business and Economics is written informally for easy comprehension. Unlike traditional textbooks it provides a combination of explanations, exploration and real-life applications of major concepts. Mathematics for Finance, Business and Economics discusses elementary mathematical operations, linear and non-linear functions and equations, differentiation and optimization, economic functions, summation, percentages and interest, arithmetic and geometric series, present and future values of annuities, matrices and Markov chains. Aided by the discussion of real-world problems and solutions, students across the business and economics disciplines will find this textbook perfect for gaining an understanding of a core plank of their studies.